This content came from the Barney Oldfield scrapbook. Most of the material in his scrapbook is newpaper clippings, but these are unique artifacts because they are a collection of telegrams. 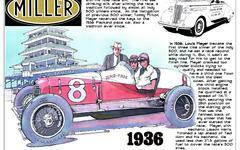 All are associated with Oldfield's run in the 1914 Los Angeles to Phoenix "Cactus Derby." There are three telegrams in this collection. One Barney sent to his wife Bess from Prescott, Arizona at the end of the second day of the three-day endurance test. He tells her of his struggles with rain and hail while scaling a mountain at Gold Road. The second telegram has two copies and is from Harvey Firestone to Barney congratulating him on winning the race. Firetsone also extends an invitation to the champion driver to join him and some of his company executives on a hunting trip on his farm on November 16. Finally, there is another congratulatory telegram from the Stutz Motor Company, most probably from founder Harry Stutz, although it is not personalized in that fashion.